Gamblogger: Join Jack Bauer in beating baddies – and winning big! Join Jack Bauer in beating baddies – and winning big! 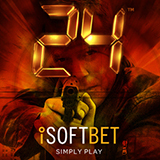 Shoot for success as hero Jack Bauer in a brand new slot game based on the classic TV series ‘24’. Gamers can feel all the drama of the iconic show as Free Spins become a gun battle and an automatic fires out symbols that turn into Wilds. ‘24’ features the dramatic music of the famous Kiefer Sutherland series, while the screen bears the distinctive graphics and gadgets that made the TV show such a favourite for more than a decade. Licensed by media giant Twentieth Century Fox, and created by iSoftBet (http://www.isoftbet.com), this is the best way for gamers to play like a Counter Terrorist Unit agent. “It’s an action-packed game that is recognisable to fans around the world,” said Twentieth Century Fox’s Michael Doyle.